This week’s You Capture challenged us to use the macro settings on the camera. Meaning up close. Really close. I know this is similar to last week’s You Capture photo, but I couldn’t help it. You see, I have no idea where this flower came from. It just appeared overnight (and wasn’t one that I planted.) I noticed it after watering the flower gardens, and knew that I needed to capture it right then. So I did. And yesterday, I realized the flower was gone. Strange. Head over to Beth’s blog to take part in the challenge, and to check out other photos. It’s a pretty fun thing to do on days like this! 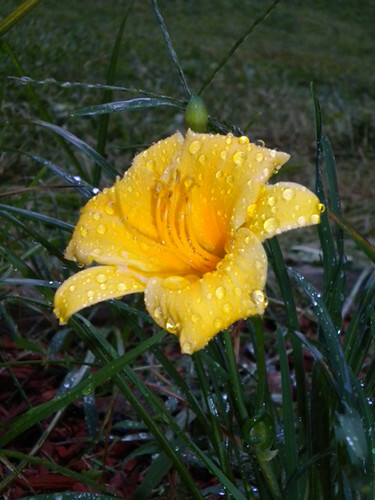 There is just nothing as beautiful as a flower covered in water droplets. I love the water drops too – great shots!!! love the raindrops too! glad you got to enjoy it even if just for a few days! Beautiful shots. Love the raindrops! Lovely little water drops. Beautiful. Flowers always look perfect with water droplets blanketing them. So pretty. Lovely flowers, and I agree. You must find the beauty around you even when it feels dreary. 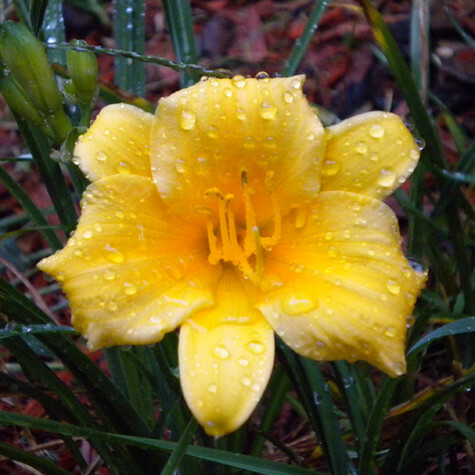 The raindrops on the petals is beautiful. iLove how you capture the water drops! Beautiful! I love rain drops on flowers. Beautiful! I love raindrops on anything! It feels so fresh! Great job. I love raindrops on stuff. This is a beautiful capture. Flowers are one of my favorite things to photograph, and those water drops make it even better!